“The main point of the parable is that entrance into the kingdom comes by grace. The workers are rewarded for work they did not perform. This is hardly a surprise to us; in fact, we practically expect it. –These are the first 4 paragraphs from the sermon for Septuagesima, based on Matthew 20:1-16. With Ash Wednesday nearing on March 6, now is the time to order your copy of Thy Kingdom Come. 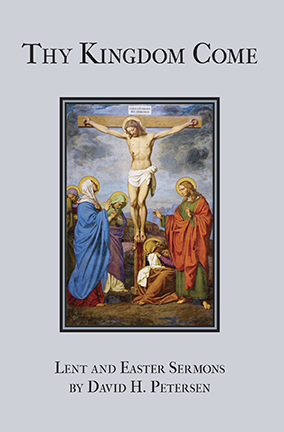 This book of sixty sermons begins with Septuagesima (February 17) and continues with Pre-Lent, all forty days of Lent, and the Sundays after Easter. Pastors and parishioners alike find it to be an excellent daily devotion during Lent. Click on the Reviews tab above for links to interviews and reviews, have a look at the Table of Contents here, or use the word cloud in the right sidebar (“Thy Kingdom Come” or “Petersen”) to find a variety of excerpts. This entry was posted in Latest News and tagged Lent, Petersen, Thy Kingdom Come. Bookmark the permalink.